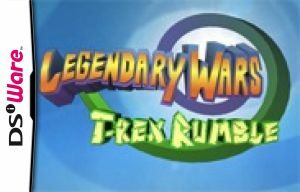 To play Legendary Wars: T-Rex Rumble is to take your emotions for a ride. When you first see its great graphics and hear the fantastic sound design accompanied by a lighthearted sense of humour; when you play the first level and realise that you've learnt its somewhat complicated framework in an easy and enjoyable fashion; when you see that the world map is actually a neat globe of Pangea that you can spin with the stylus: on all these occasions you might think it's too good to be true. Yes, the game has flaws, and it may break your heart to encounter them as they're frustrating enough to potentially ruin the whole, otherwise amazing, thing. A great man once said that when a bird poops on your ice cream cone, it's no longer an ice cream cone but a serving of cold bird excrement. Unlike said dessert, however, you can accommodate yourself to these flaws, a task that's very much worth your while. You're in charge of a once great semi-nomadic tribe that's lost its magic relic and is trying to return to its former glory in a world full of murderous dinosaurs. It's a strategy game in the same fashion as Command & Conquer or Little King's Story, though you can only create troops, not buildings, and you can't upgrade anything. You gradually gain access to four types of men, all with their own strengths and weaknesses, and a shaman who can heal your men or confuse enemies into attacking each other. 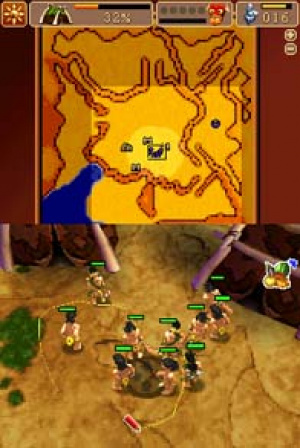 The main objective for most missions is to fill your storehouse with food so that your tribe can survive. Different plants grow throughout each area that sprout the fruit you're to collect and bring back. You'll do the same with resources and other items that are scattered about, the former of which you'll use in different amounts and combinations to create troops (except for the simplest settler, as the only ingredient required to create him regenerates automatically with time.) 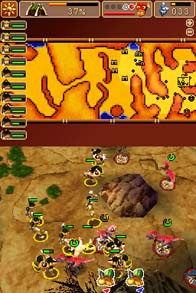 Dinosaurs roam about the landscape, and after you kill them you can collect meat and bring it back home with the rest of your food. Things are a bit more complicated than that, though. Sometimes rocks block your path, with the only way to blow them up often being to carry a limited supply of explosive fruit across dangerous terrain, for example. Perhaps the most challenging factor is that each harvest will go bad if you don't reach it and return it home quickly enough, and with most plants yielding a limited number of harvests time truly is of the essence, adding a sense of urgency to the entire experience. 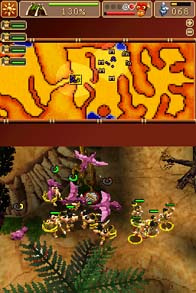 Additionally, different soldiers are more powerful against different enemies, each of which is unique and has its own style of attack for you to learn. This means that you'll have to pay extra attention to your available resources so that if there's, say, pterodactyls down the road, you'll have enough hatchet-throwing soldiers to take them down and enough raw material to spawn them. It feels very satisfying to complete one of these complex levels, and it's this sophistication of gameplay that really makes T-Rex Rumble shine. The controls are quite intuitive as well, and while complex, the first level tutorial does a great job of explaining everything. 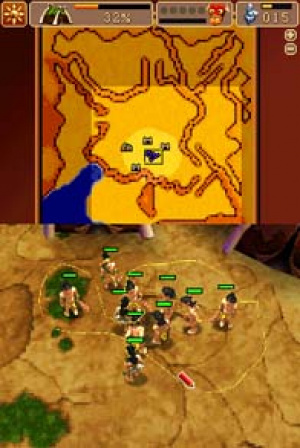 You select men using the stylus and group them by dragging a target that appears at their feet onto others or by drawing a lasso around large groups, of which there is no size limit. Afterwards, simply click on their goal and they'll know what to do. Men are created in huts, each of which is limited in the amount of soldiers that it can house and, in turn, the size of your potential army. As soon as the elder leader begins to narrate the story, you'll be won over by the amusing cartoony presentation. The music and sound effects are great as well, the former adding a sense of drama to the proceedings and the latter reinforcing the blithe spirit. While not always a visual feast, it looks and sounds great and is crisp and detailed. Despite all of these wonderful aspects, the game has significant flaws to which you'll have to acclimate yourself. Why bother going out of your way to make up for a game's shortcomings? Because the rest of it is that good. Let's get the biggest one out of the way first: these tribesmen are stupid. You'll realise this when you see one of them just standing around doing nothing, staring at a perfectly ripe patch of fruit when on the other side of the atlas you're frantically creating grunts so that there's enough to carry it home before it rots. This is endlessly frustrating, and you'll just have to get used to it – your men, after they are told to pick up something, will take it home and automatically return to the spot from which they got it. Unless it's from the same patch, and often when it is, they will not collect any more fruit until you tell them to. Babysitting them just becomes part of the game and an extra challenge, but you might be tempted to give up if you can't find the patience. It's without a doubt a design flaw, but it's worth getting past. On the other hand, they will attack enemies of their own accord, so you won't have to worry about one of your men dumbfoundedly staring at a dinosaur as it massacres his friends. Conversely, the dino AI is very sharp. They'll send their strongest to the front lines: one member will approach your camp and lure your solders into a more dangerous area when they chase after it. They'll infiltrate your camp or choose to stay away from it. 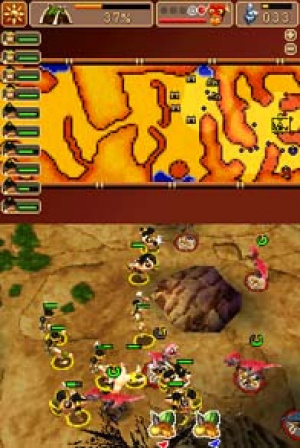 All in all, battling against these dinosaurs is a challenging and rewarding experience during which you'll have to think through your attacks before executing them. The controls are also a bit glitchy. When you select an individual and tell him to do something far away, it doesn't always read correctly and sometimes the game will simply deselect him, leaving the man standing around doing nothing. Selecting a moving person can be a chore, and the act of separating an individual from the group seems unresponsive and sloppy. Also, large contingents of people can get in the way of others, neither of which seem to know how to get out of the other's way. Telling men apart is an area in which the mostly impressive graphics fail the player, at least at first. While with enough practice this stops being a problem, the two classifications to which you initially have access look very similar to the untrained eye. When coupled with the difficulty in removing one from a large group this can have you frustratingly sending feeble fighters into battle when you'd rather have them hang back so that they can carry supplies home. Sometimes there's not enough time to clear the enemies before harvesting produce and you'll have to instruct some soldiers to fight as others sneak by, and having a hard time telling who is who can mean defeat. 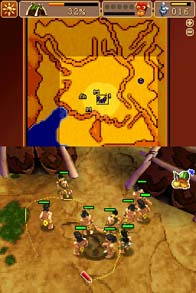 There are also little glitches that you'll encounter along the way; while we played the game for review it froze up once, a soldier picked up a piece of meat and then endlessly ran around in a tiny circle, and on two occasions a second shaman appeared out of nowhere when you're only allowed to have one per camp. In addition, while there are two save files, you cannot stop in the middle of a mission and come back later to complete it. As some of them can take up to an hour or more with multiple complex strategies required along the way, this is quite unfortunate. After each stage, you'll be ranked and your level of skill judged, adding extra replay value for those to whom going back and discovering the best method holds appeal. All of these flaws can frustrate a player beyond any desire to continue through the game, and when things get especially frantic and difficult they are exponentially more obnoxious. Stick with it, though. 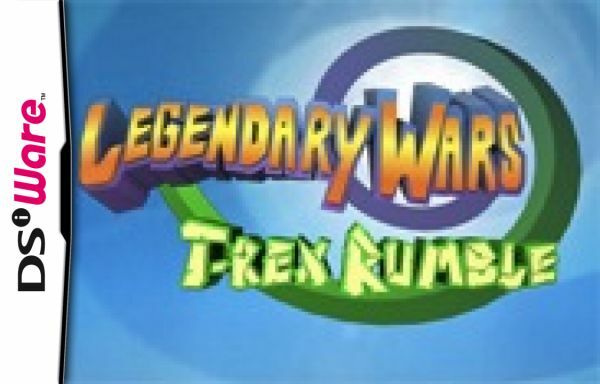 Even with all of these problems, T-Rex Rumble is a very good game. Most likely due to size restrictions augmented by the fantastic presentation, it's only six missions long (including the tutorial stage), meaning that there's not a lot of room for more laid back levels during which you can play with any cool new features you've unlocked or control the tribe while they're celebrating their success rather than trying to solve a new problem. Each level, however, should keep you busy for a very long time. 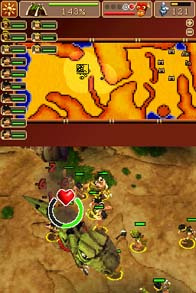 T-Rex Rumble would be an automatic recommendation if not for the occasionally dumb-as-a-rock AI of your soldiers, the often glitchy controls and other small flaws. It's still very much worth picking up, however, as once you come to terms with them you'll find a very challenging and rewarding experience with complex enemy intelligence and missions that require a lot of thought and repeated attempts. While it has only five real missions, it should keep you entertained for hours and hours, though during this time you will not be able to save in the middle of a stage. If the designers took care of these shortcomings and expanded the experience into a full retail version, it could be one of the system's best games in the genre. instead of making people wait even longer for a full cartridge release, we decided to try a DSiWare version and see how players would respond. That way we can tailor future episodes to meet demand and hopefully build a bigger and happier community of players, starting with a downloadable inexpensive first episode. Hopefully we can look forward to more instalments and then eventually a big retail release! @Sean Aaron Thanks for the nice comment, and for the research! Hopefully by the time they release the full version, they'll have taken care of the kinks that plagued this one. I agree with Labrat7, As I like the C&C games, and didn't have a major problem with T.Twilight, And the fact that is a very lengthy Review. To add to my last Comment, I saw this when I got my DSi (on Friday) and didn't buy it because of it's price, I would rather have it be shorter and 500 points to try it, and if you like, have some sort of DLC (or wait for the Retail Version), but in the end, I don't think 800 points is worth it, unless you have tried it somewhere else and liked the game. With only 5 levels, I dont think this will be my next 800 point download though. @cheapogamer4life Thanks! I just want to emphasize that these levels take a very long time each, especially the last two or three. Perhaps still not worth 800 points to the competitive shopper, but not an egregious rip-off either. Seriously good review - told me everything about the game I could possibly want to know, and done so in an entertaining and engaging fashion. As for the game, I do hope it gets a local (Australian) release. @WaltzElf Thank you so much for the nice comment! I'm glad that you enjoyed reading and will continue to strive hard to write better and better reviews. I too hope that it enjoys a release in Australia, or even outside of the U.S., but I hope even more that you all get to see later iterations in the series, or perhaps the full retail release if they do eventually create one. By then, hopefully they'll have fixed the problems that plagued this one and got in the way of the great gameplay. I'll consider! Great review, Zach! This game is made by the same people who made Sacrifice, one of my favourite games ever. @Bobpie Thanks! I hope it comes to Australia/NZ, it's likely the deepest DSiWare experience I've had, even with those stumbling blocks. @Zach Kaplan Thx 4 the review, I may get it as well.